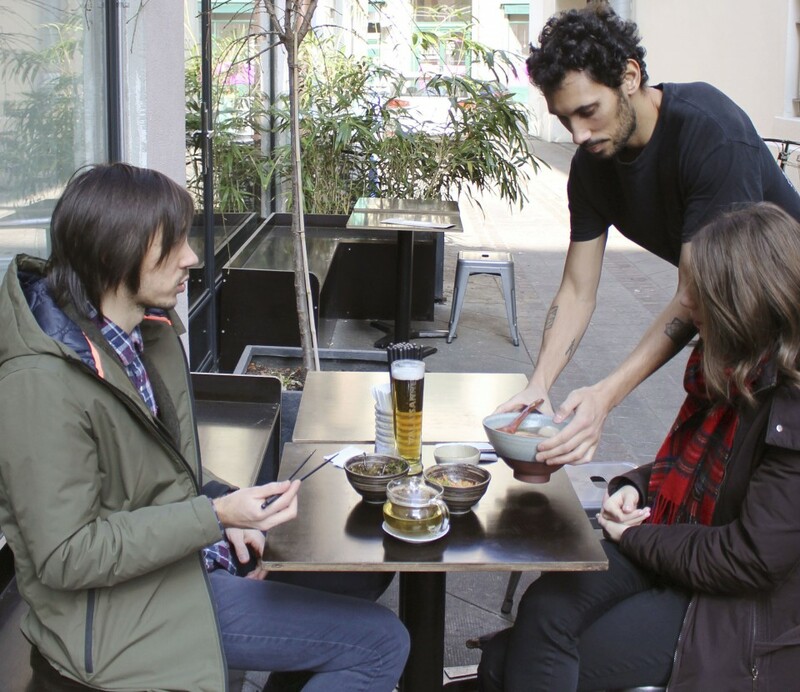 In Switzerland's second most populous city, where nearly half the residents are foreign nationals, largely from Europe, locals can choose from at least four recently opened ramen shops in the city's central district. Proprietors include not only native Japanese, but also Swiss nationals who spent time in Japan and later set out to master the rigorous yet highly adaptable art form of quality ramen for their home market. 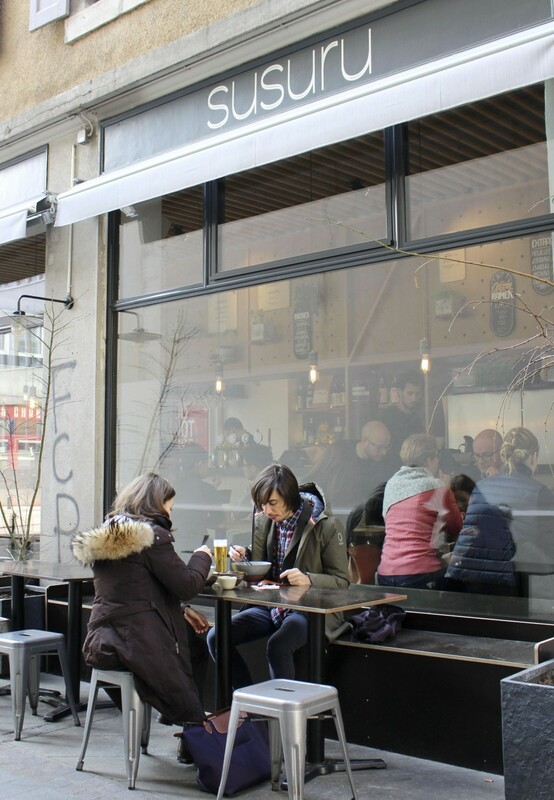 "The idea is to combine Japanese flavors with top-quality Swiss products," said Lionel Coudray, 36, one of three co-owners of the ramen restaurant Susuru. "Fresh products such as vegetables, meat and flour are local and the noodle production is artisanal, while the rest of the products come from Japan," he said. Prior to launching the venture last April, Coudray had spent time walking around Tokyo to sample various styles of ramen, and also studied under a chef in Singapore to build up his knowledge of the dish. He currently oversees noodle production for Susuru using a noodle-making machine he imported from Japan after raising 40,000 Swiss francs (about 4.4 million yen) for the purpose through online crowdfunding. "There is a trendy aspect about ramen among young people," Coudray said, explaining that the typical ramen dining area with "no rules, no forks, no set table" and a view into the open kitchen promotes a casual atmosphere. Sandra Miura, 36, who along with her husband, a Japanese chef, opened the Geneva ramen shop Yukiguni in 2014, connected the trendiness of ramen to the larger appeal of Japanese culture. "I think the success of ramen in Switzerland is due to curiosity to discover a different culture, and people surely have seen ramen in movies, magazines or comics," she said. As a high school student, Miura enrolled in an exchange program from Switzerland to Japan's Shizuoka Prefecture. She went on to study Japanese history at Waseda University in Tokyo. Having felt since her student days that the delicacy could catch on in her home country, Miura said that Yukiguni helped to "satisfy a need that has been present for some time in Switzerland." While Japanese cuisine of all kinds has gained popularity in Geneva over the past several years, ramen has a distinct price advantage in a city whose cost of living runs high. Whereas a sushi dinner costs at least 40 Swiss francs (around 4,500 yen) per person, a good bowl of ramen comes in at about half that. Hokkaido native Masahiro Numabukuro, 56, had already opened sushi and tempura restaurants in Geneva before deciding to branch out with a ramen shop, partly in consideration of the pricing. "I thought the (ramen) restaurant is for students, for a younger clientele, because sushi and tempura are more expensive than other food," said Numabukuro, who opened Nagomi last August with a specialty of Hokkaido-style ramen. "I want younger people to be able to enjoy Japanese food without any hesitation," he said. Formerly known as a working-class food consumed at vending carts, ramen has become a culinary fascination in Japan and abroad as chefs have refined techniques for noodle production and found nearly endless possibilities with broths based on traditional elements like miso or pork bone. The dish also features prominently in Japanese pop culture that has struck a chord overseas, including Juzo Itami's comedic film "Tampopo" from 1985 and the manga series "Naruto" launched in the late 1990s. "I think that interest in contemporary Japanese culture got people interested in Japanese traditional cuisine," said Barak Kushner, a historian and expert in Japanese culinary culture at the University of Cambridge. He noted that ramen, as a "very meaty" food, also had similarities to European cuisine that helped to ensure its acceptance. "(Ramen) is al dente noodles in a soup, a very rich soup, (though) you can change the taste slightly to adapt to almost every region, so it became very popular," he said. Miura, whose shop in Geneva includes vegetarian as well as meat options, observed that ramen with its strong flavors and variety of toppings has found a more robust following in Europe than udon or other Japanese noodle dishes. "We are proud to have contributed to launching this fashion, and now more Swiss people know ramen," she said.